With the rise of online shopping, online dating (tinder anyone?) and online connection (Facebook, Twitter)… I wonder if the art of face-to-face networking will become even more of a struggle for some? 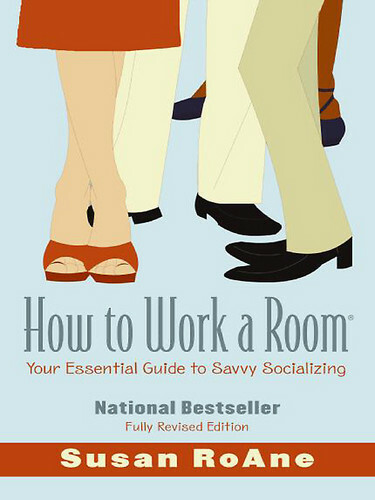 This book deals with how to shine at those face-to-face networking events. Perhaps you’ve had one that you need (or want) to go to for business? You want to go but you’re scared of that big room full of strangers. Next thing you know, you’re sweating, feeling sick and coming up with excuses not to attend.. Well here’s a few tips and tricks you can try. My fav quote is wee aronymn that Susan uses called OAR> observe, ask, reveal. She emphasises that along with asking questions (a common tip you’ll find in every communication book) is that you need to REVEAL something about yourself. I think this is a big hurdle for many who struggle with connecting. As Susan rightly points out – if you just ask questions then it will come across as an interrogation rather than a conversation! Many of the tips in this book were similar to what I’ve read elsehwere, so I’ve only mentioned a few favourites. If you like this sort of advice then another one to try out is Leil Lowndes book ‘How to Talk to Anyone’. Have a look at the book here.